When I was in my 20’s any money found in a jacket or jean pocket was instantly declared “beer and pizza money.” At the time that meant dark, bready beer and piled high garden supreme with Canadian bacon from the local pizza joint two blocks from my house. While I still love a good dark beer, I have discovered the delight of wine and pizza – and for about the same price. I am a fan of Italian wine with pizza. There is something to the suggestion to pair foods of a region with wines of a region – it works. Italian wines can sometimes be intimidating. There are over 2,000 grapes indigenous to Italy – many with odd names that aren’t grown much anywhere else. Some rival the finest Bordeaux in cellaring requirements and price. They can be very “old world” in flavor with minerals, tar, and antique wood smells lying on top of the fruit. To me this sounds wonderful – but not with pizza and not with the $10 I found in my jeans. One of my favorites is Nero d’Avola. This grape is grown in Sicily – a hot sunny mountainous island in the Tyrrhenian Sea. The heat of the day results in ripe grapes full of fruity flavors. The high elevation of the mountains help the ripening grapes cool down at night and keep some of their natural acidity. And this translates into the experience in your glass of Nero d’Avola. Dark fruit makes this wine delicious and the acidity matches that found in the tomato sauce plus it allows the creaminess and flavor of the cheese topping to shine. 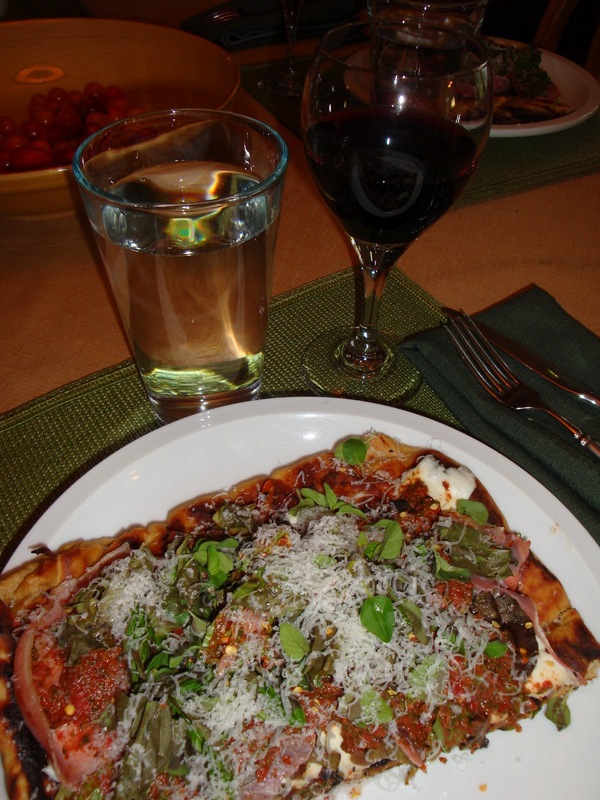 The wine’s spiciness adds another dimension to the flavor of the pizza. Alcohol is usually ample and well integrated. Tannin and complexity of flavors varies with price and winemaking, with more tannic wines suitable for aging. Most of the pizza priced wines will have softer tannins. And unlike Chianti, also great with pizza, you do not have to spend a lot to get a good bottle. Two I have tried recently in the $10-$12 range are Zonin and Villa Pozzi. And if you are wondering what happened to the beer – we used it instead of water to make wonderful pizza dough and drank the rest while preparing the pizza.